Astronomy 101: the Sun, the Moon, and the Stars! Registration is now closed. Ever looked up into the night sky and wondered what’s up? 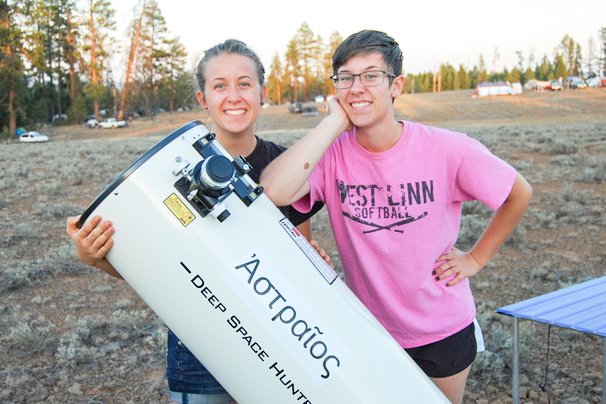 Experts from Rose City Astronomers will prepare you to explore the universe. Learn the fundamentals of observational astronomy, how to use binoculars and telescopes to explore the night sky, to observe planets, star clusters, nebula, galaxies. Learn about objects astronomers study, how and why our view of the night sky changes through the night, and with the seasons, how telescopes work and how to use them, and how to find your way in the night sky. We will finish with practical advice on how to prepare for a night exploring the universe. In addition to the classroom sessions, telescope observing opportunities under the night sky will be offered. Students and their families will be invited to a end optional star parties with Rose City Astronomers after this class. Four two-hour sessions, 10 am – noon Saturday, April 14, 21, 28, and May 5, 2018. Saturday Academy - Beaverton, Suite 1100 NW Compton Drive, Beaverton, OR 97006. Grade range: 5 - 9. Register through Saturday Academy below. Instructors: Michael McKeag, Katherine Kornei, Todd Duncan, Kenny Parton. Star Party Option: We will also provide students and their parents with a schedule of Rose City Astronomers star parties scheduled for May and June 2018. An instructor will be available to serve as host and guide for students and their family if they choose to a end one of these events, telescopes provided.